The Wild Atlantic Book Club: "Love You to a Pulp"
"Love You to a Pulp"
Neil Chambers = What a character!! A down-on-his-luck PI with a longing for the good old days. He seems to have been born thirty years too late, but that's the least of his worries. He's on the trail of a runaway girl whose in with the wrong crowd. As you read the story you'll be transported into the world of the main character, where you experience the same sorrows he experiences. One of the marks of an excellent writer is their ability to create characters that are believable, intriguing and real. 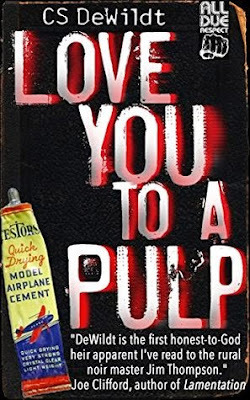 "Love You to a Pulp" by Cs Dewildt is classic noir story set in Kentucky, USA. Fast-paced and rough-edged with some nice surprises. So if you like crime fiction that's easy to read & harder to put down - Pick this up.